The nice and warmer weather is hopefully coming back and finger crossed it will come to stay. So if you love open air, breathtaking views and involving your dog in your social life, you will be excited to know that here are a few rooftops that allow you bring your pooch along! 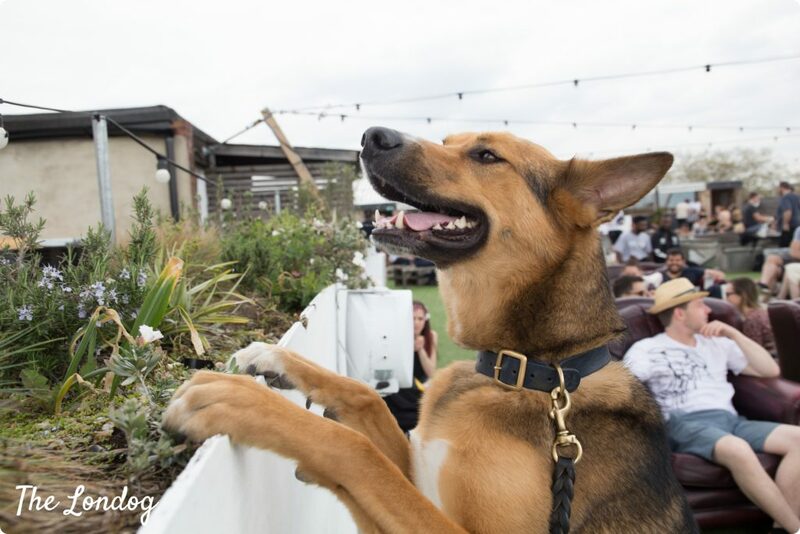 We put together a guide about the best dog-friendly rooftops in London, sharing our insights to help you making the most of the nice season. 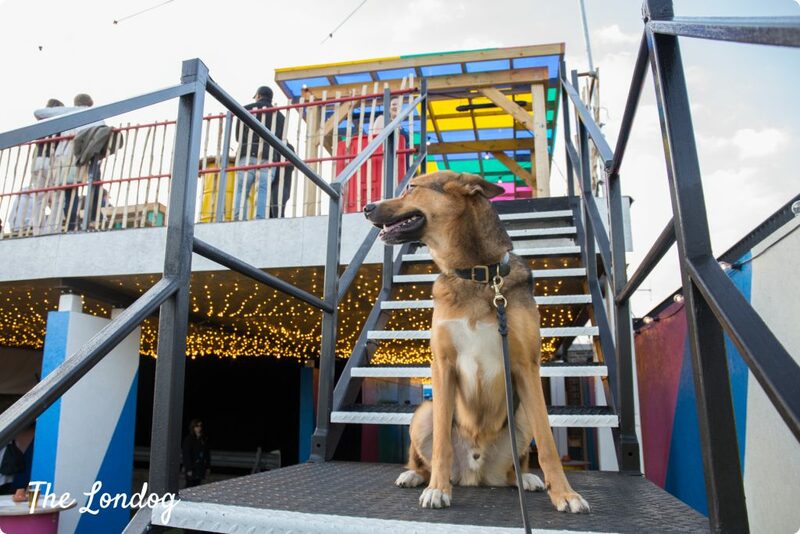 Originally featuring East London rooftops only, we have now expanded it to include South London dog-friendly rooftops we visited over the Summer, as well as new openings, and more will be added to the list soon ! Between Aldgate and Spitafields there is The Culpeper, a very unique pub and restaurant, which has a lovely rooftop. 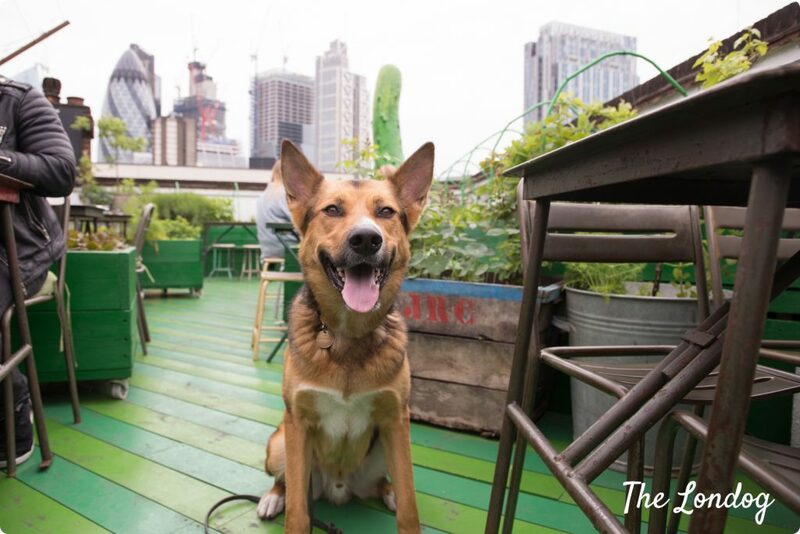 Dogs are allowed on the “Piculpeper” rooftop – which is a little green paradise with a cucumber/pickle theme – as well as in the pub (but not in the restaurant or in the bedrooms). There are no restrictions in terms of dog size/breed and no hours limitations either, so you can visit the rooftop with your furry friend whenever convenient during its opening hours (see below). Booking is not required if you want to bring your dog, but since it gets quite busy, it is highly recommended. 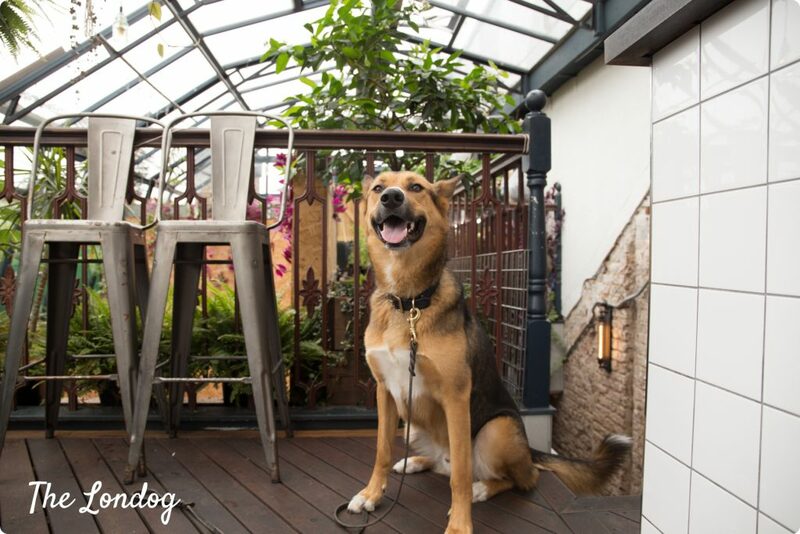 Among the dog-friendly rooftops we visited, the Culpeper’s has been my absolute favourite, maybe because there are so many plants that you feel in a peaceful oasis. I love that from the rooftop you can see the Gherkin and the Culpeper adopted its very own resident gherkin totem “to celebrate the power of the pickle in physical form for all of East London to see”. Furthermore, there are cucumber-shaped cushions and lots of real cucumber plants grown on the rooftop too, along herbs and other plants! It is such a cosy secret vegetable garden that you would almost expect to see Peter Rabbit peeking out any minute. If you are curious, you can learn about the Culpeper’s awesome philosophy that is behind its rooftop growing (you can read all about it on their webpage – at the bottom). I would recommend it for a weekend brunch with your dog, when it is not crowded. Dog restrictions on the rooftop: None. Music volume: Music is played from a small speaker at the rooftop bar, but not in the outdoor area, as confirmed by the Culpeper, so no concern for dogs! Netil 360 rooftop is located just around the corner from London Fields, which makes it the ideal destination for post-stroll refreshments. 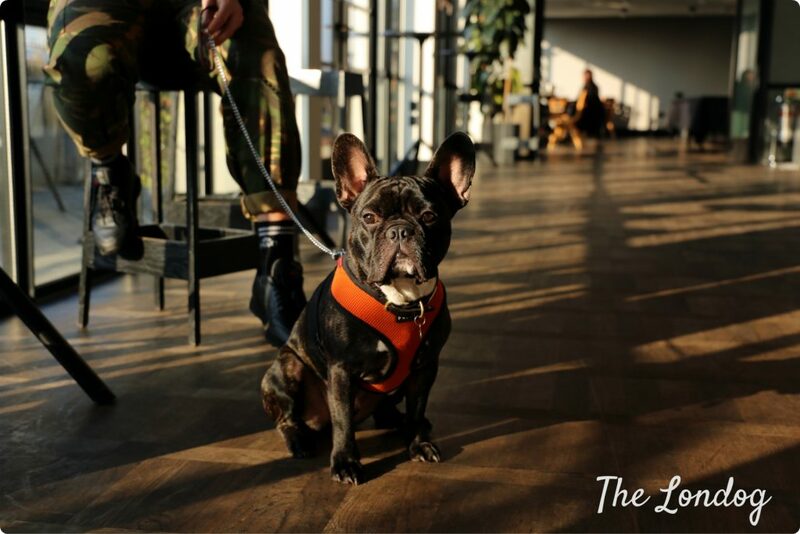 Well-behaved dogs are welcome and Netil 360 has even got a resident rooftop dog: the very friendly 11-year old mutt Tres, who roams free to greet guests! For this reason, Netil 360 advises that, if your dog is not the social type, you keep him/her on a lead and under control at all times. In the terrace area, there is a fake lawn flooring, cushions and sofas, and from the rooftop you have a view of the skyscrapers of the city (though quite far away) and the metal gasometers remains by the Regents Canal. There is a no children policy in place. Dog restrictions: Dogs that are not friendly with other dogs to be kept on lead and under control at all times. The Skylight London has finally re-opened last week! While last year we we weren’t lucky with the weather, this time around we managed to pop by with Argo on a nicer day to check it out. Apart from drinks and food, Skylight London offers some fun activities: croquet, pétanque and football fun. 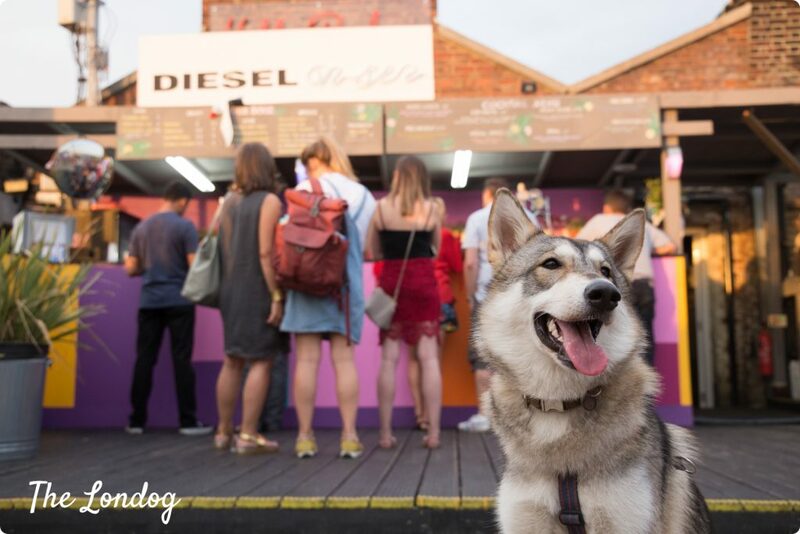 However, although it is open Thurs/Fri: 5pm-11pm, Sat/Sun: 12-11pm, the management confirmed that dogs are only allowed during the day until 6pm, which basically leaves you with the weekend option (unless you want to rush there for one hour on the other two days from 5 to 6pm). To me, this dog restriction sounds absolutely reasonable, considered that in the evenings the place becomes quite crowded and there are DJs and music playing on all floors, which would be quite unconfortable for a dog. When we visited the Skylight, Argo was a bit worried about the noise coming from the football area: the ball was kicked against a panel on which are projected images of a football pitch, next to the entrance and closed on three sides: from behind the panel, you hear the noise but can’t work out the source. When / Dog Restrictions: Dogs are only allowed only during the day, Saturday-Sunday 12-6pm. This year Skylight will not close after the Summer, but will stay open with an all-new Autumn (and Winter) season(s). Opening:Dogs are only allowed at daytime, Saturday-Sunday 12-6pm. This rooftop is seasonal. Now closed, it will reopen on 2nd May 2019. Music volume and others: Music is playing from speakers on the rooftop. Your dog may be worried by the noise of the balls hitting walls/hurdles. 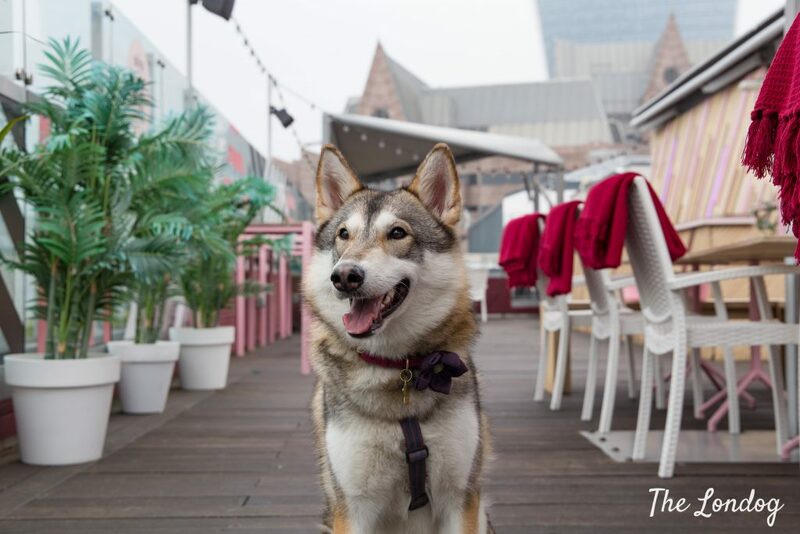 Savage Garden rooftop, atop of the DoubleTree by Hilton Hotel, close to the Tower of London, is not dog-friendly on any day, due to the current hotel’s policy, which bans pooches from the food and beverage areas apart in occasion of special events. 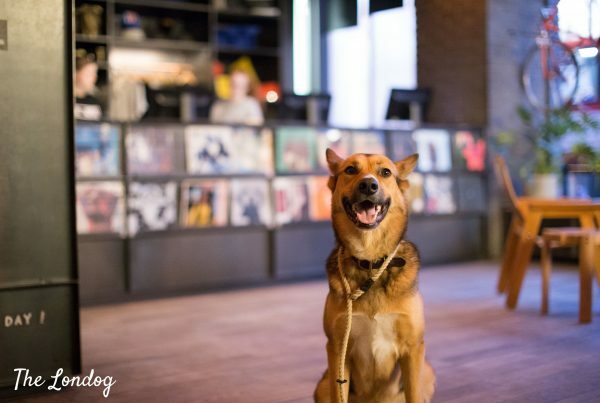 Savage Garden launched its first dog-friendly brunch on 7th April 2019 which will be a regular appointment on the first Sunday of every month, from 12 to 4pm. This stunning rooftop, which has an indoor area around the main bar and a terrace, has fantastic views on some of London’s best landmarks. You can book your table contacting them. When / Dog Restrictions: Dogs are only allowed on special dog brunches on the first Sunday of the month, 12-4pm, with prior booking. Probably the lowest rooftop, the Midnight Apothecary sits on the roof of the Grand Entrance Hall, which is part of the Brunel Museum (also dog-friendly), in Rotherhithe. The roof has a garden, where they grow herbs used for the cocktails ad they have a campfire to warm up and roasting marshmallows on the fire. Well-behaved dogs are allowed, but be careful around the fire. 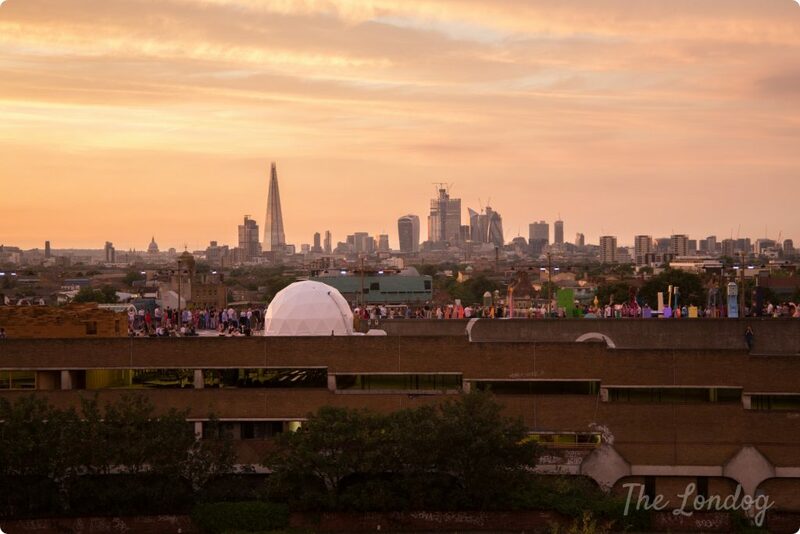 In Peckham, atop of Bussey Building there is Bussey Rooftop Bar, which offers breathtaking sunsets. 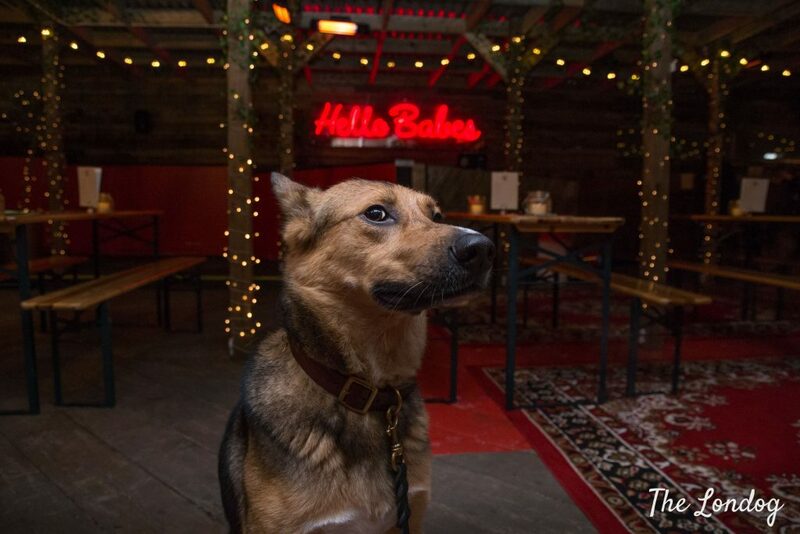 With drinks and food, it is a lovely place where to spend a dog-friendly evening with your furry one. You can also combine it with a film at the Rooftop Film Club silent cinema next door. While the bar is normally seasonal, last Winter, it had a makeover and opened over Winter with a cover, heaters and a lovely chalet theme. We visited on an incredibly rainy early December day, so it may have been not very crowded, but we enjoyed the quiet, and their setting was lovely! Opening and hours: Seasonal, currently closed, expected reopening: 1st May 2019. Peckham Levels is a building just opposite Bussey Building in Peckham. As a former car park, it was re-developed and now hosts a bar, workshops, shops, a coworking space and more (they even run a free film club). On the rooftop there is Frank’s Cafe, which we hadn’t the chance to visit yet, as it had already closed for winter when we visited the Near & Far bar on one of the levels, but we saw it from Bussey Building before. We will be telling more as soon as we visit this Summer. Opening and hours: Seasonal, currently closed, re-opening date will be 30th May 2019! We personally love the Ace Hotel in Shoreditch. 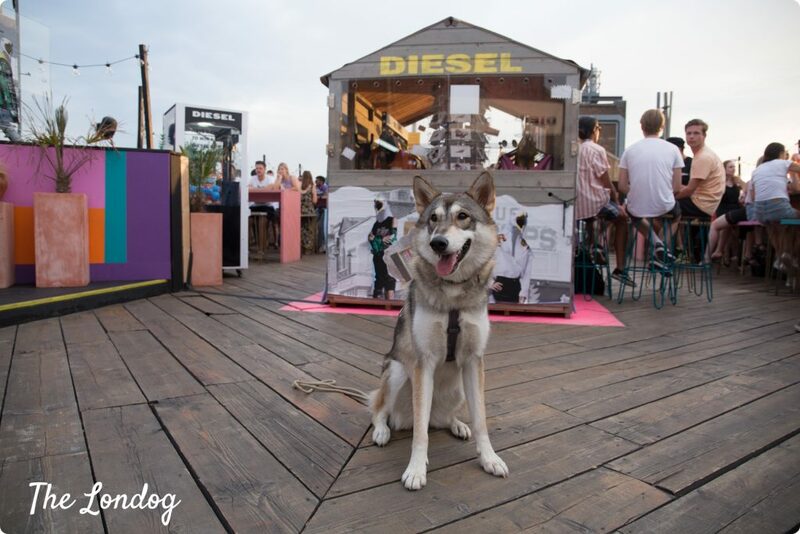 Apart from having a very elegant rooftop bar, from which you can enjoy a stunning view of the city, they are super dog-friendly. In fact, they allow dogs of any size not just in the hotel rooms (with a number of perks), but also at the restaurant and at the rooftop bar. Last year they even hosted some dog events, including the Dog Eat Dog II canine catwalk. Until recently, they had a resident hotel dog called Pofi, who we interviewed within our Office Dog Series. Unfortunately, the Rooftop is not generally open to the public, so you will be able to enjoy it only if you are staying at the hotel or get the chance to attend a RSPV event open to outsider guests. Also The Curtain hotel has a resident hotel dog, who is very appropriately called Shoreditch. The hotel is dog-friendly (no dog size discriminations are made) and has a wonderful rooftop restaurant and bar (that has a luxurious heated outdoor pool too), the Lido. This is strictly open to hotel guests and Curtain private club members only. Many rooftops do not allow dogs. Just to give a few examples, you won’t be able to take your pooch to The Boundary nor to the Queen of Hoxton in the East End, as confirmed with the staff. 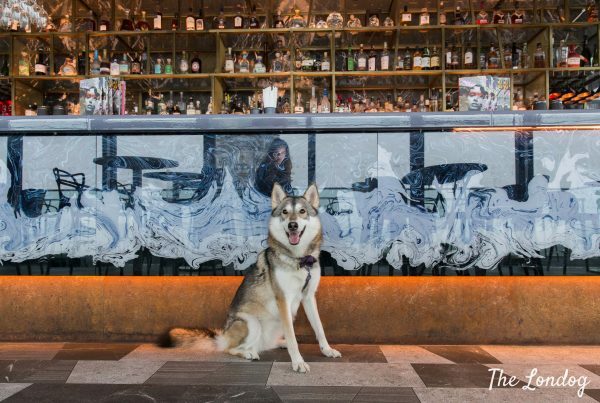 If you move towards the city, you won’t be luckier at the One New Change rooftop terrace in St. Paul either, where ‘no dogs’ is sadly the policy. To be honest, some rooftops may not be the most appropriate place for a dog anyway in the evenings: loud music, crowded spaces, not much to enjoy for a pooch. However, it would be lovely to see more places turning dog-friendly at least during daytime hours. 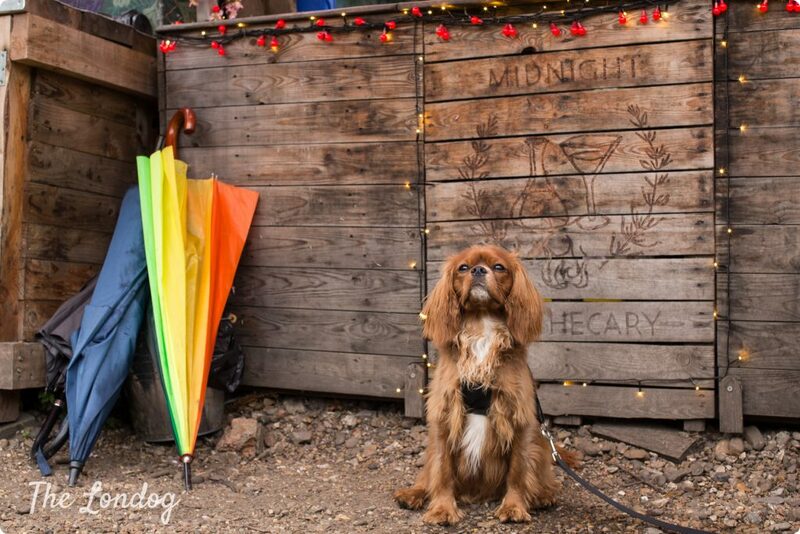 At least you can visit one of the lovely dog-friendly ones in this post!